On October 29th, 1973, Les Malass, the Provost of Virginia Tech, called Tony Distler into his office. As the current Head of the Department of Performing Arts and Communication, Tony was given a very special message: T. Marshall Hahn, Jr., the President of Virginia Tech, wanted an All-University Marching Band, and it was Tony's job to create one. Hired in the spring of 1974, Roger Heath, the former Assistant Director of Bands at Purdue University, was charged with creating a new band on a campus where a (military) band had a long history of tremendous support from their alumni. Faced with countless obstacles, Heath exhibited overwhelming enthusiasm and a tireless work ethic. Heath’s connection with Blacksburg was one of those amazing "I know a guy" stories. Prior to eight years of service at Purdue, Heath had gained a national reputation as a high school band director in Iowa and Montana. Richard Cole, who was the chair of the Music Program at Virginia Tech in 1974, knew Heath from their days teaching in Great Falls, Montana, Cole as orchestra director at C. M Russell High School and Heath as band director at Great Falls High School. They grew to be good friends, and their families shared camping trips at Glacier National Park. When the position at Virginia Tech was announced, Cole contacted Heath for suggestions about candidates. Heath expressed interest in the position himself – he wanted to have his own program rather than simply serve as an assistant to Al G. Wright at Purdue – interviewed and was offered the position. Along with his enthusiastic family, Roger put a plan into place to have a band on the field that fall. 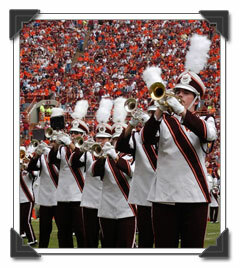 When the band debuted on September 28, 1974, the new tradition at Virginia Tech was a mere ten days old! Under the direction of Roger Heath, the newly-created Marching Virginians band was over 100 strong and patterned after the fast-moving Big Ten bands, emphasizing pageantry, spirit, and high-energy entertainment. Virginia Tech was, at that time, culminating a period of exploding enrollment; the character of the student body was in flux, and Tech and The Marching Virginians were in many ways searching for their identities. Those first seasons were not without growing pains, but excitement ran high in the group and the University community over this “new tradition” at Virginia Tech. The enthusiasm of that early band was a direct reflection of Roger Heath’s hard work and dedication to the band members and the university. Heath served as director of The Marching Virginians from 1974 until 1977; he passed away in Boulder, CO, on May 22, 2004. 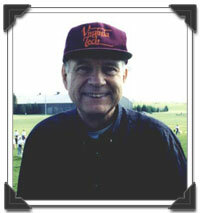 During his tenure as Director of Bands (1978-1990) James Sochinski moved The Marching Virginians into a second period of development. Hired in 1977 to conduct the Highty-Tighties, Sochinski directed both bands during the fall of 1978 during a time when a proposal to combine the two bands was being developed by the administration. When that plan failed, he was asked to decide which group he preferred to conduct, and Sochinski chose to lead the MVs beginning in 1979. The focus of the band was changed forever. 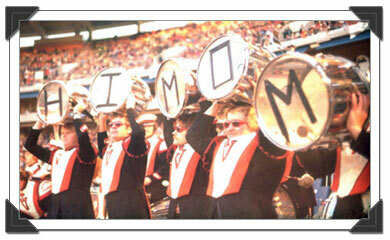 Turnover was minimized and numbers in the band began to grow, reaching 225 by the 1980 Peach Bowl. Precision drill and corps-style concepts were gradually integrated into the band’s style, and music and sound assumed the greatest rehearsal priority. 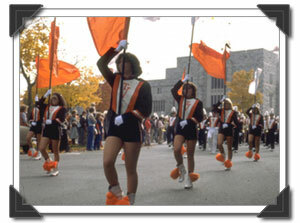 It was determined that band membership should represent the Tech student body, and a commitment was made to develop the identity of The Marching Virginians as a band of - and for - Virginia Tech students. Sochinski initiated the signature music and visuals that have become part of the Hokie football tradition, including his arrangements of the VPI Victory March, the pregame Colors Presentation, and The Hokie Pokie. With his background as an arranger and musician in the U.S. Army Field Band, he immediately put his musical stamp on Virginia Tech, penning countless works for The Marching Virginians. Musical “standards” began to appear in the book, notably his arrangements of Tech Triumph (replacing the multiple versions being played) and The Hokie Pokie. Sochinski’s ability to produce literally hundreds of arrangements for the band meant that the group was playing charts unique to themselves. The signature sound of the band became the sound of Uncle Jim, with priorities on a massive, rich and “sophisticated” sound. Unique arrangements of classical masterworks, rock and jazz standards, and movie themes formulated with thoughtful and immense attention to detail helped the MVs create a sound that was fresh and memorable at the same time. The tremendous influence of Uncle Jim on the band remains the single most important element in the growth and development of The Marching Virginians in their thirty-two year history. Musical traditions, performance traditions, and the unique stylistic qualities of the band can all be attributed to the visionary leadership and innovative musical skill of James Sochinski. The overwhelming majority of tunes in the book are timeless examples of the over 200 arrangements he has written for the MVs. The highly supportive Marching Virginians Alumni Association, with early guidance from Bonnie Maccubbin, was the brainchild of Sochinski who encouraged Maccubbin to “get a few alumni together” in the fall of 1984 for their first alumni event. Little did they know how things would grow! 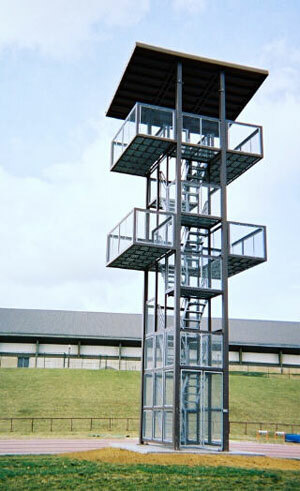 Standing atop the "Perch", Harry Price served as the band’s first full-time Director from 1981-1986. During his tenure, The Marching Virginians matured and began to achieve their potential. New uniforms and a new look were introduced in 1982. Following the growth that began during James Sochinski’s era, the numbers continued to grow, with the band reaching 330 members in 1984, this number being established as an optimum, permanent size. Instrumentation was developed to ideal proportions with a 240-wind section of woodwinds and brass players augmented by percussion and auxiliaries. Travel and exposure were greatly expanded. Innovative show design established a unique "show band" style that became a trademark of the MVs. Price established traditions such as Band Parents Day and the first Alumni Band performance. He was a key player in the development of the band’s logo, working with James Sochinski and trumpet-playing architecture student Vic Dover in 1983. 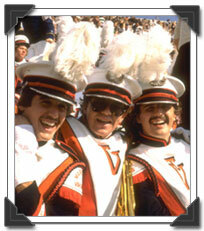 He directed the band on its first recording, The Marching Virginians, 1974-1984: The Spirit of Tech. 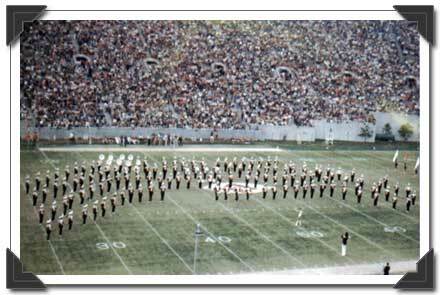 The band’s 1984 performance of the Olympics show at Clemson University was greeted with a standing ovation, a rarity for a visiting band in Death Valley and certainly a highlight of Price’s years as director. 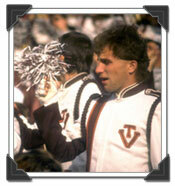 David McKee came to Virginia Tech in the fall of 1984 to pursue a graduate degree in music education. He had taught high school bands in Tennessee and Virginia for eight years. Working as a graduate assistant for Harry Price, McKee quickly established himself as a team player and creative force with the MVs. In McKee’s second year with the MVs, Price promoted him to “Assistant to the Director,” as an acknowledgement of his contributions to the band. In the spring of 1986, Harry Price announced his resignation to assume a position as director of graduate studies in music education at the University of Alabama, and Virginia Tech offered McKee an interim position as Director of The Marching Virginians. 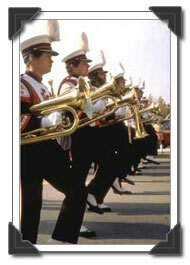 Under McKee, the MVs established themselves as a nationally-respected marching band program. The band attained a high profile in national venues while fostering a culture of professional musicianship, student leadership, high-energy performance, and public service. 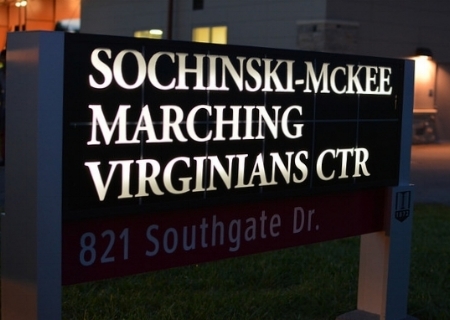 At home, the MVs made a permanent mark on Virginia Tech's campus through the building of a practice facility named the Sochinski-McKee Marching Virginians Center, in honor of these two former directors. While many of the positives surrounding The Marching Virginians can be attributed to the rise of football prowess at Virginia Tech, the band has continued to demonstrate enhanced creativity, creative programming, community activism, and excellence in all aspects of performance. The MVs have shared the performance field with many of the outstanding programs in the country, including Florida State University, Indiana University, Auburn University , and the University of Texas. In every case, the MVs have more than held their own, exhibiting excellence in marching and music throughout every phase of their performance. They truly are The Spirit of Tech.